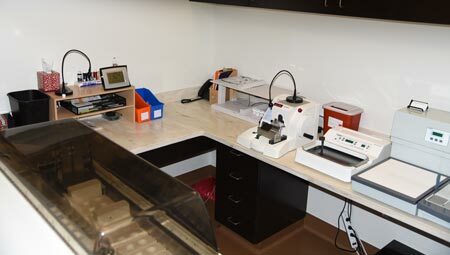 Colorado Dermatopathology is our in-house, state-of-the-art laboratory here at Colorado Skin & Vein. Our skin care experts understand the value of having an on-site laboratory for the convenience of our patients and specialists. Licensed under Federal CLIA guidelines and Colorado Statutes, we are pleased to offer you our clinical services at the Colorado Dermatopathology Laboratory. 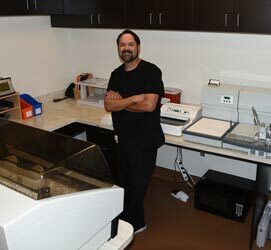 Michael Medina is our in-house lab technician and the laboratory manager of Colorado Skin & Vein. Mike received his business management degree from the University of Phoenix and trained at the Armed Forces Institute of Pathology. After his military service, Michael was the histology supervisor at Swedish Medical Center and Dermatology Associates of Colorado. 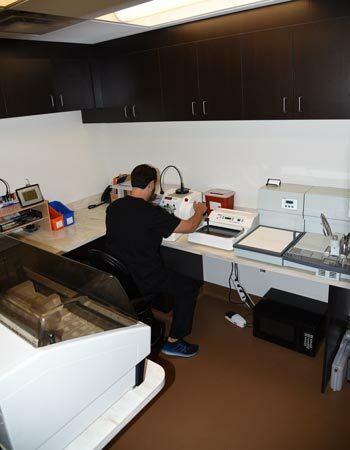 With over 25 years of histology experience, Michael is always available to assist you. Referrals: We can accept any referrals from physicians in neighboring states, as long as they are permitted by state regulations. We want to make ourselves and our expertise available to you, no matter where you live. Transportation: For your convenience, a courier service is available to transport specimens within the metro Denver area and the surrounding counties. FedEx® is also available to transport samples outside of this radius. Pathology Reports: We can integrate with most electronic medical records (EMRs) to instantly deliver pathology reports. There is no reason to keep you waiting. Turnaround: Patients who come to our in-house lab can look forward to quick results. Most results are available in just 24 to 48 hours. 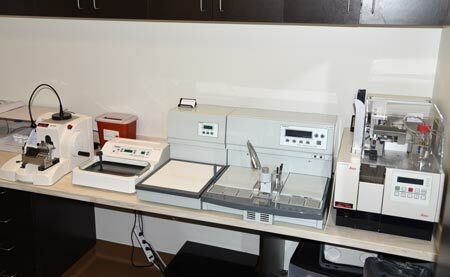 At the Colorado Dermatopathology Laboratory, we provide many dermatopathology tests. Our focus is to study, diagnose, and treat cutaneous diseases (skin diseases) as well as to identify potential causes of skin diseases. These tests can be used to assess your risk of developing a disease, identify a medical condition or disease, and determine the proper course of treatment. With all our tests, we can offer a second, third, or later opinion to help you feel secure in your diagnosis. We also ensure all of our patients know that difficult cases are discussed in detail in a conference setting so that we reach a consensus before giving a diagnosis or recommending a treatment plan. Existing Clients: Please complete the above requisition form. To submit, either fax it to (303) 683-3236 or attach it to the specimen when delivering it to the courier. New Clients: Please contact our office at (303) 683-3235 and speak to Mike Medina (laboratory manager) or Courtney Miller (patient coordinator) to set up your client profile. Supplies: To request supplies, please email Mike Medina at mike@coloradoskincare.com. Pathology Reports: To request pathology reports, please email Tabatha Downing at tdowning@coloradoskinandvein.com.